If your garden looks like this right now, it means you did a good job of planning ahead, planting fall bulbs to produce an explosion of spring color. If your garden doesn’t look like this, don’t worry! This is an excellent time to plan your bulbs for the fall. I like to use my digital camera to identify empty spots in the bed where fall bulbs will fit. It’s much easier than drawing the bed on paper or placing stakes, which usually disappear somehow before bulb-planting time. My book, The Ever-Blooming Flower Garden: A Blueprint for Continuous Color, shows you how simple it is to plan a garden that blooms reliably from early spring through summer heat and on into the frosty days of fall. One key to successful bulb displays: don’t skimp! The thicker the planting, the more lush the results. 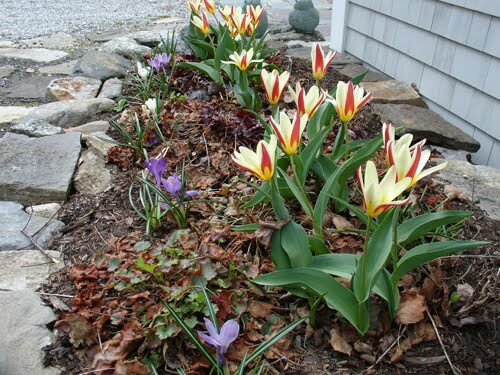 And be sure to choose bulbs that perennialize well; that is, bulbs that will come back year after year. The tallest perennializing tulips are the Darwin hybrid tulips. 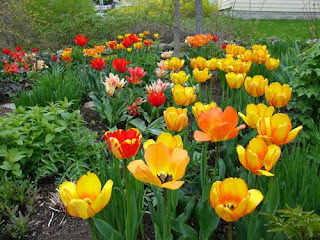 Many other tall tulips are meant to be grown as annuals, and they will be a huge disappointment after the first year. 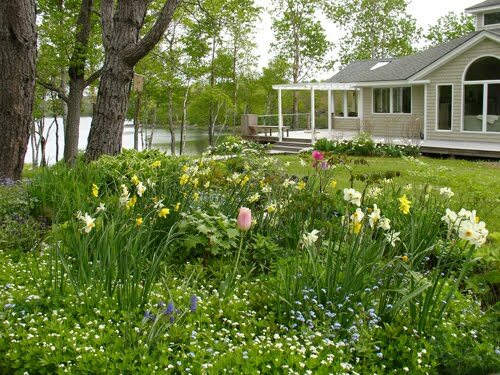 All-white gardens look especially cool in spring when their snowy blossoms are set off by the dark, moist soil. Later in the season the bed will fill in with foliage, so the later white blossoms will be offset by green instead. 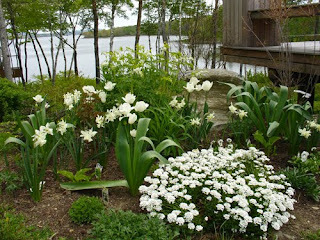 In this photo the white alliums are not yet in bloom, but you can see their broad, straplike foliage. The white flowering shrubs in the background are Rhododendron viscosum (swamp azalea), a fragrant, native summer-blossoming azalea, and Clethra alnifolia (sweet pepperbush or summersweet clethra), another elegant shrub with fragrant fall blooms. 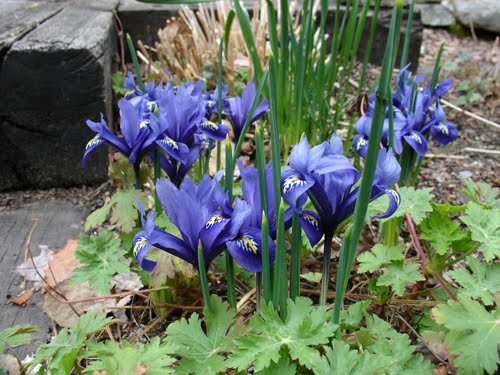 Complementing spring bulbs with early-blooming perennials is a great way to extend your spring palette and to get some foliage working for you in the garden. Bulb foliage has to be left to “ripen” for 6 weeks after blooming ends, so it’s important to plant bulbs behind foliage plants such as daylilies to hide the unsightly ripening leaves. Some spring perennials in this garden are Galium odoratum (sweet woodruff), Brunnera ‘Jack Frost’ and Pulmonaria longifolia ssp. cevennensis (lungwort). The bulbs are Narcissus ‘Lemon Drops’ and a shady woodland narcissus mix (plus a couple of stray tulips that roamed in to join the party). I don’t like to settle for just one type of bulb or tulip, and thoughtfully choosing a combination of several varieties can give you many weeks of color. I love Kaufmanniana tulips because they bloom superearly with the crocuses! In Maine that’s usually in mid-April, but it can vary quite a bit from year to year. Another gorgeous and underused bulb that blooms around crocus time is Iris reticulata (dwarf iris). These little sweeties are about 6 inches tall, and they make a great statement when planted in a mass. Remember that dark flowers look tempting in catalog photos, but you’re better off choosing light colors that stand out against the dark earth in spring. Taking photos and notes now is an effort you’ll thank yourself for in the fall when those beautiful bulb catalogs arrive. Beautiful!! I hope you do more posts like this. I have something coming up in the sandbox this year! Did not notice before, found a few dozen clumps. No flowers yet but would like to know what they are and if I can move them. I can send a pic to help with identification.